Every public school campus in Livingston Parish that was damaged by the flood — except for the three substantially-damaged campuses that have been under the purview of FEMA – has been restored to pre-flood status, and in most cases, improved from its pre-existing condition. This milestone is no small accomplishment. Contractors and maintenance supervisors estimate that the work completed over this nearly two-year span is equivalent to building at least six new schools, while maintaining reoccurring maintenance jobs and repairs throughout the district. Of those 16 impacted sites, five received three feet of water, and four received four to six feet of water, with three schools – Denham Springs Elementary, Southside Elementary and Southside Junior High – receiving catastrophic damage. “A significant factor in this recovery timeline has been our ability to cause minimal disruption to classroom learning,” Murphy said, noting that much of the work has been done over the past two summers and during holiday breaks, when the students and teachers were not on the campuses. After nearly two years of uncertainty over the future of three “substantially damaged” schools in the Denham Springs area, Livingston Parish School officials have received the go-ahead from FEMA to begin the process of demolishing and rebuilding two of the three campus sites. Assistant Superintendent Joe Murphy said the district has received permission to replace all but the multi-purpose room at Denham Springs Elementary School, and all but the band room at Southside Junior High School. The band room and multi-purpose building were newer and had less damage from the 2016 flood. He said the district is still negotiating with FEMA on the rebuilding cost and plans for Southside Elementary. 2 ½ to 3 years. Students assigned to those schools will remain at the temporary campus sites until the home campuses are fully rebuilt. 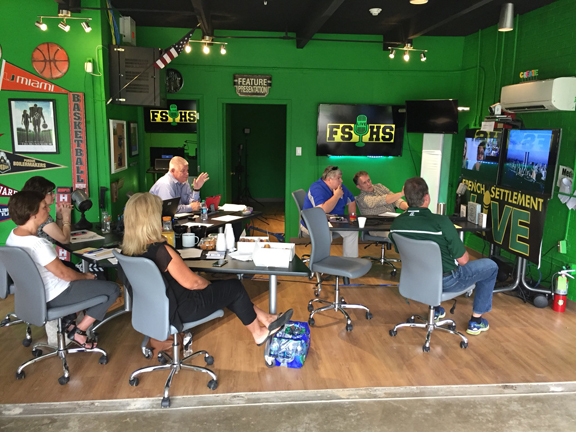 Livingston Parish School Superintendent Rick Wentzel, top left, recently met with principals in School Board District 8 at the French Settlement High School broadcast classroom to discuss the use of distance learning on their campuses to enhance curriculum opportunities for students. Pictured top center and clockwise to the right are Springfield High School Principal Spencer Harris, Springfield Middle School Principal Dwayne Dykes, Maurepas School Principal Kenny Kraft, Springfield Elementary Principal Catherine Martin, French Settlement Elementary Principal Lindy Gill, and Frost School Principal Stacy Wise. Schools in the southern-most part of Livingston Parish will be better able to connect to each other and the world, overcoming challenges of their rural settings, thanks to the district’s participation in a USDA grant program to incorporate distance learning curriculum opportunities at those campuses. “The program electronically links teachers in one area to students in another,” said Distance Learning Program Director Janet Blakenship, adding that distance learning can be as effective as classroom learning in terms of student performance. It offers opportunities for enhanced curriculum and advanced classes, such as physics, anatomy, chemistry, music theory, or calculus. The technology also allows teachers to include curriculum-based virtual field trips in their instruction, including visits to museums, planetariums, zoos, and even space. Classes can use the technology to collaborate with other schools and businesses, including team teaching with different schools. Those schools participating in the distance learning program are Springfield High, Springfield Middle, Springfield Elementary, French Settlement High, French Settlement Elementary, Maurepas and Frost. 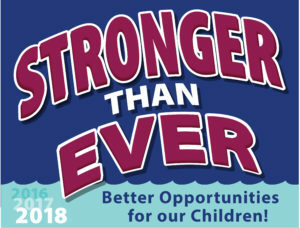 Students in Livingston Parish Public Schools continue to exceed their state peers on accountability tests, with nearly half of all students at all grade levels achieving Mastery and Advanced ratings on the latest state assessments, according to the Louisiana Department of Education’s report released this week. The results of the Spring 2018 Louisiana Educational Assessment Program (LEAP) exams for grades 3-8 and high school End of Course assessments show 45 percent of all students scored Mastery or above on the combined sections. The latest state report also showed Livingston Parish Schools to have strong scores in math. The most outstanding results came among 8th graders who took the Algebra 1 exam – 95 percent scored Mastery or Advanced. At the same time, 51 percent – more than half – of the district’s eight graders and those high schoolers taking Algebra 1 scored at the Mastery and Advanced levels. 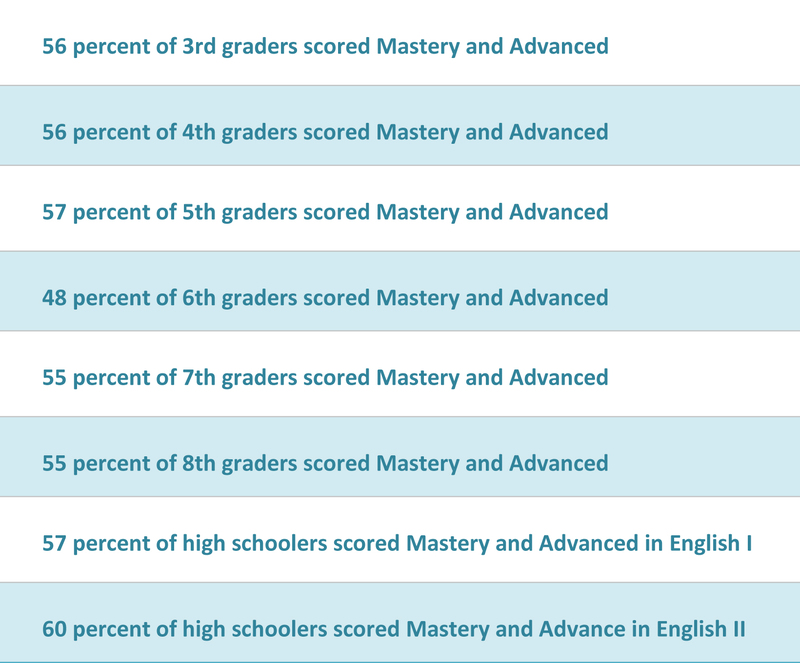 The next highest percentage of top performers came from grades 4 and 5, with 44 percent and 43 percent, respectively, achieving Mastery and Advanced in math. School officials and U.S. Congressman Garret Graves recently celebrated the opening of a U.S. Marine Corps Junior Reserve Officer Training Corps program at Denham Springs High School. The new program will be housed in a newly renovated and expanded facility on the campus. It will be managed by Senior Instructor Lt. Col. Ronald Bias, who said he has begun meeting with students already, and anticipates as least 170 students to enroll in the program this school year.